This blog was born out of my goal to write about one new plant every day for a year. Common name, scientific name, plus whatever fun facts I stumbled across. I met my goal and I’m still adding plants, though now at a more relaxed pace. I’ve gotten a lot of great feedback, and am delighted that people are finding this a useful resource! I am a science writer and environmental consultant. I earned an undergraduate degree in botany from the University of Washington, and have dual masters degrees in Earth and Environmental Science and Journalism from Columbia University. Work and research have taken me from the rural fish camps and canneries of Alaska to the oil-soaked shores of Louisiana. Science articles have been published in the New York Times, Salon.com, Modern Farmer, Bay Nature, and more. Scientific experience includes managing restoration projects, environmental assessments, vegetation management plans, invasive species control, wildfire planning, vegetation mapping, and wetland identification. I am currently the technical editor for the academic journal Northwest Science, and co-author of the book The Light on the Coast. I love your writing! Very clear and informative. 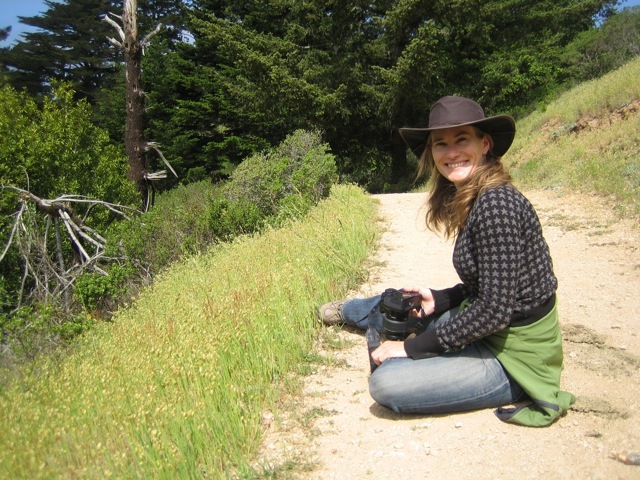 I posted a link to your blog on our San Francisco Naturalist Society website. Thank you Patrick! For the feedback and the link. I understand your frustrations about the discipline of learning the local flora. I got my degree in range management. Although the practical applications of range mgmt usually center around grasses, I was always taken with the “wild flowers” here in Wyoming. Now, many years after grad school, it seems I can’t ever make myself stop and key out plants. I hike a lot, take photos regularly, and propagate a few natives every year to add to my home landscape. I can almost always ID the genus of a local plant, and many to species, but either I don’t have my references with me, or I’m wanting a work out and don’t want to stop to key out the more complex genera like the asters, etc. I like your idea of taking one plant a day. It removes the overwhelming feeling of trying to learn it all at once. I’ll enjoy keeping up with your blog. Thank you! I love the idea behind your blog and enjoy learning a little about the plants in your area. I have really enjoyed writing and think it has been rather therapeutic at times. Most of my posts are about daily events focusing Cody and Carter and my posting schedule is erratic at best but it is a lot of fun. Hi Jacoba, One of our members just turned me on to your wonderful site, so I linked it from most of our hiking pages (left sidebar) with our other flower info. Beautiful pictures and clear information. Thanks so much Steve! I hope people find it useful. So happy I found your blog! I love the plants of the Bay Area, and your beautiful photographs and interesting facts and stories make me very happy! Hi there! For years I’ve been captivated by the aroma of a shrub/flower that grows in large patches in Marin & Sonoma, and I’m dying to know the name of it! It’s flowers are yellow (somewhat in bloom currently), it’s “stems” are close in color to wheat fields, and they are somewhat resinous/sticky to the touch. The resiny smell is high pitched, almost as if sage and grapefruit were mixed together. They seem to grow up to 3-4 feet high. On warm days when walking by patches of it, the smell is very pleasant albeit hard to describe. I hope you know what it is! I couldn’t find it on your site here. Hi Dan, it sounds like it could be a tarweed–there are several types with yellow flowers, a pungent smell, and sticky stems. It’s pretty hard to say without a photo though! Do you or would you be a leader of hikes in Marin relative to wild flowers in bloom? I enjoy hiking and many times I have tried to identify flowers with a book in hand that has not been very successful. I was thinking that I would enjoy accompanying an expert that knew where and when the wildflowers of Marin bloom so that I could actually be certain of my identification. I’m sure there are others out there like me that would enjoy hiking with an expert too. My thoughts are that there are probably a number of organizations that would support offering such a hike. I live in Mill Valley and my thoughts are that local groups such as the Tiburon, Corte Madera, Mill Valley, etc. recreation offices, churches, or environmental nonprofits such as Point Blue in Petaluma might happily support such an idea. My husband and I hiked with a naturalist in Yosemite once years ago and we remembered how rewarding it was to hear from an expert about all the local flora and fauna. I have always thought I would enjoy doing the same in Marin, Sonoma and Napa.